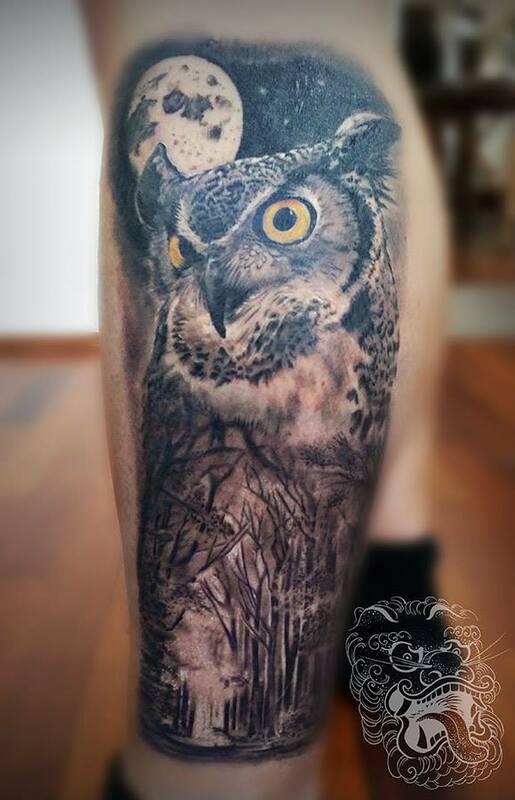 Animal Tattoos — Malan - Top Realism Tattoo Artist working from Germany, Neuwied. Elephant, gorilla, pandas, horse, birds - animal tattoos always look great, and are unique. While people images keep attributes of actual person, animal tattoos are a bit more abstract in meaning and universal. Photo reference for this tattooing is as important as in other realism work. 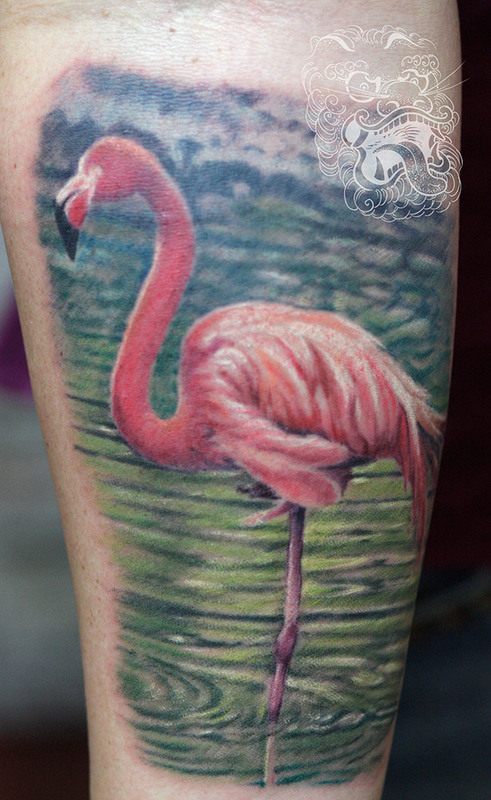 Also decision about color or monotone tattooing should be made in relation to animal we are going to portray. Toucan should be executed in color, as well as black panther (surprisingly!) - as those animals without use of color may appear without depth or lifeles. Artist must represent high level of knowledge to execute anatomy different to human. Also proper size of the tattoo matters. Cat can be small, but tiger shouldn't. In this animal tattoo elephants were executed in black and grey to stress romantic picture of mother caring for her child. This very personal animal tattoo reflects on nature of panda bears. Animals are usually well connected to certain area, land, or country. It is not rare to choose specific animal in relation to its habitat. This might be related to favouritte country, where important part of life was spent or to someone important in our life. Gorilla tattoo is always a very powerful image. Strong drawing skills are always needed in tattooing. Pure reference is not all. In this animal tattoo, shape of the crocodile had to be changed to follow natural flow of customers body. Wolf is along the most often choices for tattoos in western tattooing culture, and not without a reason. He can be chosen for its relation to nature. Tattoos with forest, full moon or mountains are good examples. I also feel that wolf nature is very important to people who decided to brand their bodies with it. Showing teeth may be sign of aggression or second nature, almost second face. Calm wolf with closed mouth is often chosen to say: "I stand the ground, my will is strong, but do not play with me". Some customers choose wolf with pups for relation with children and caring aspect of this tattoo. Personally I think wolf is such a classic, that will always look good. It's nature is so close to our culture, that it is pure fun to tattoo. 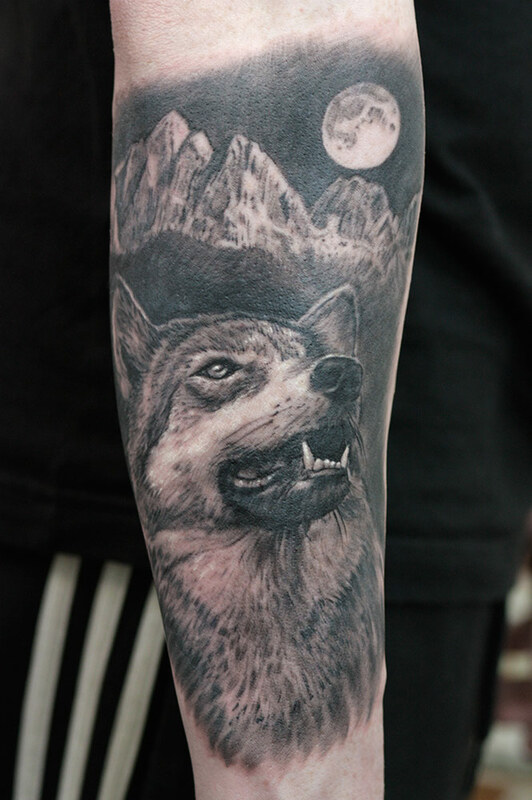 With this wolf animal tattoo, customer insisted on all the elements of immortal classic to be present in composition. Whole tattoo was done in one tattoing session. This wolf composition is covering big portion of the upper leg. All the elements are highly detailed and were complited over few tattooing sessions. At the beginning of my tattooing career i enjoyed mostly those strong appearances. So wolf had to have open mouth, be scary and powerful. With time we change and so did I. At this moment I did so many different tattoos, including animal tattoos, that I believe I can truly appretieate different aspects of each design and its meaning. Fur is this wolf tattoo is an element of cover up. Fur and hair are usually great to cover old, unwanted tattoos. Photo in progress shows part of old tattoo, which in next session disappeared completely. Big cats - so panther, tiger or lion tattoos are another very powerful animals having a strong tradition in tattooing. At this point probably everyone has heard about the famous crawling panther or Japanese tiger tattoo. I dreamed for a long time myself about tiger backpiece. Heavy in meaning, strong in appearance, always will make your friends say 'wow', when seeing such a tattoo. Those animals I believe are often chosen for their lone predator nature. Lonesome hunter, staying true to one's own believes or just saying "I am the best" are usual messages behind those tattoos. Tiger traditionally is depicted with bamboo leaves. It is worth to mention that those tattoos look best when done big. Arm size, in my opinion, is an absolute minimum. Done too small and occupying the only portion of given "canvas" may appear more like a kitty than a noble creature. Tiger tattoo here was done as a first tattoo. Fair play to you my friend. And that is just a beginning! 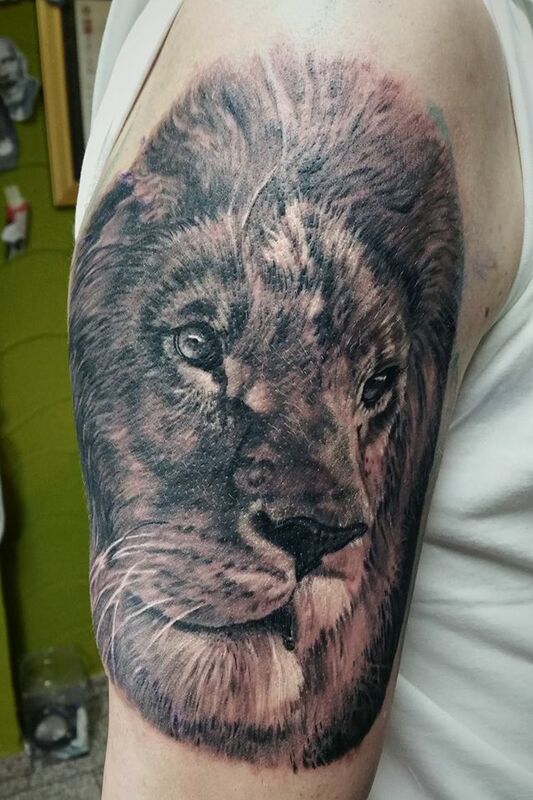 This lion tattoo was done as a part of a bigger project, and it is a starting point. It is located on upper arm for a reason to be the most important element in the whole composition. Bird animal tattoos are another well-known area in tattooing. Some birds represent freedom, knowledge and intelligence (owl). Other are proud and stay for honor (eagle), or just look great on the body. Some will relate to a specific country or land, like magpie, toucan or flamingo. In this animal tattoo, owl stands for a close connection with nature. Here is a great example of how an animal tattoo can relate to specific land. This flamingo was done as part of Spanish sleeve. Eagle, as a bird of Palermo, part of a bigger ongoing project. In this slightly stylized version, an owl was chosen more for the look, then for a specific symbolism. It is worth mention that often pure love for tattoo art is the main reason to get tattooed. Dog animal tattoos are always very personal. Usually, they are used to depict exact animals, our beloved pets. Whenever possible I try to take pictures of animals by myself, as it is usually very hard to find pictures valuable for tattooing in our phone collections. The situation gets harder when a pet is not alive anymore. That usually means for me working from mediocre quality pictures. But this is where drawing and painting skills make a huge difference. And sometimes I am able to tattoo what was missing in the reference picture. The photo was taken by me. We spent some time with a dog playing outside and praying for a good shot. Patience is crucial here as well as speed behind a camera. A dog won't pose for us, it always has some better stuff to do! 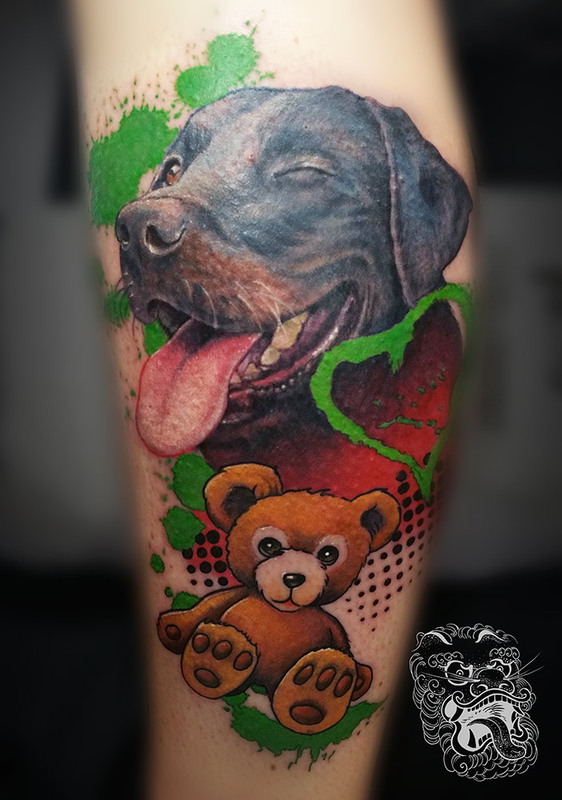 In this animal tattoo, I had a chance to go a bit more crazy and positive about a dog idea. We used a customer's reference photo, but it was tweaked and funny stylization was added. As this is a memory tattoo, picture delivered was of very poor quality and size. To make this tattoo possible I had to spend some time studying this breed and its unique qualities.